A crepe cake for my husband's birthday.Yay, finally made one. It was an impromptu attempt. I had no idea of what to bake for him this year. Made him a croquembouche tower last year, and had to find something to beat that, yikes. I finally settled with a crepe cake minutes before midnight, hoping the whole crepe-making process would bring me the same challenge. I know, to some, this is not a cake. Having those layers made it half into being a cake. But who cares. As long as I can stick a candle on it, a cake it is then. Well, I happened to sample a nice crepe cake in Japan. In Shin-Yokohama, to be exact. Somewhere near the Ramen Museum. Perfect weather; a slice of chocolate crepe cake partnered with a heart-shaped latte, and a well-behaved boy next to me, enjoying his hot chocolate. *wink* I gave chocolate some break this time, and pursued this cake with Southeast Asian twist-Thai Milk Tea. Stood up 30 minutes for that thin crepes. 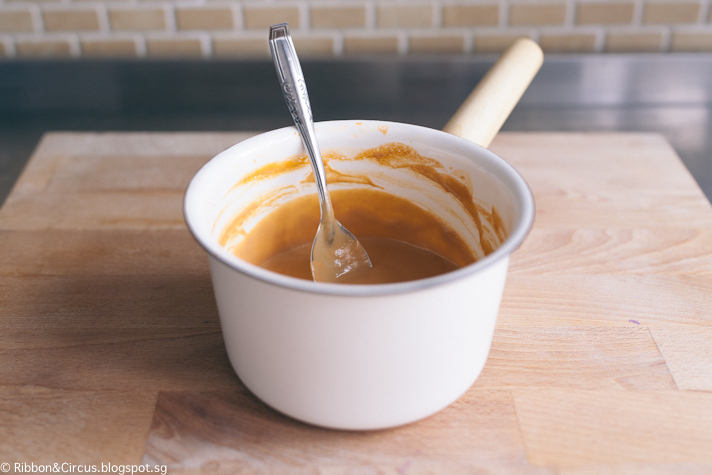 Love the quite joy I had while preparing those layers; drop a ladle of batter, quickly swirl the pan, let it dry, flip, remove and repeat. Without that particular kid's screaming, it was heaven and yeah, I'd probably do it again. 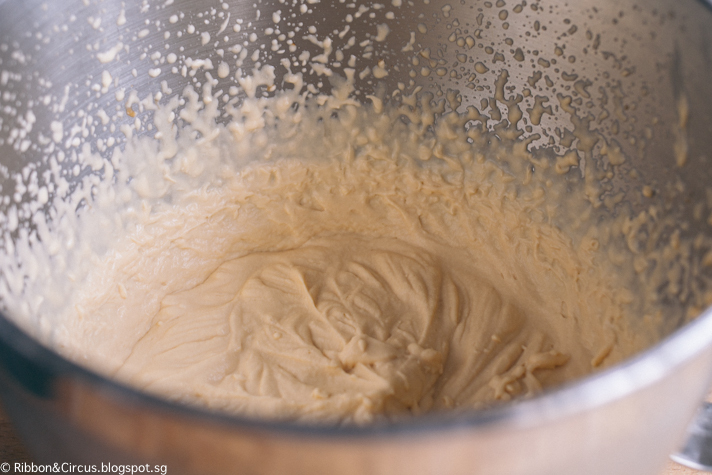 As for the pastry cream, I'm not quite happy on how it turned out; it was me, not the recipe. Some of the ingredients were poorly substituted, resulting a bit lumpy texture, rather runny than my usual cream. But it escaped the bin and made it as a cake. The topping was crème de la crème! I can't even... It was so tasty I couldn't keep my finger off of it. Assembling the cake was easy. Made a time-lapse video of it. Watch it below. 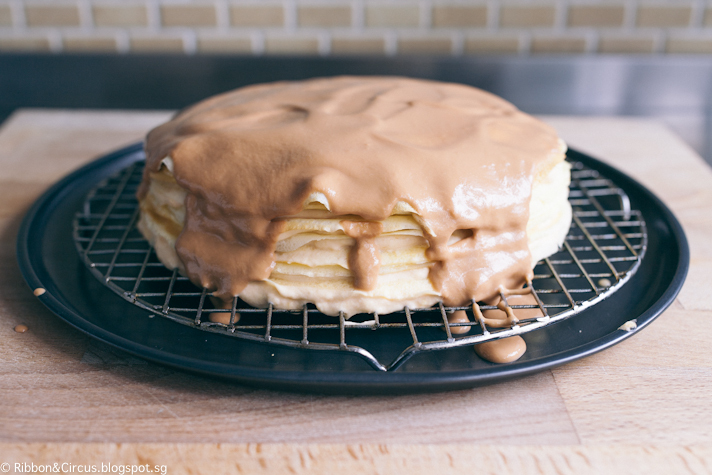 Place one crepe in the cake tin. 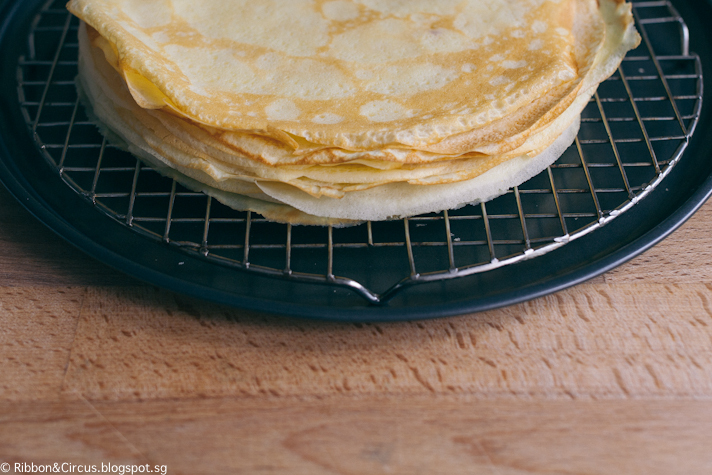 Spread one tablespoon of pastry cream evenly over the crepe. 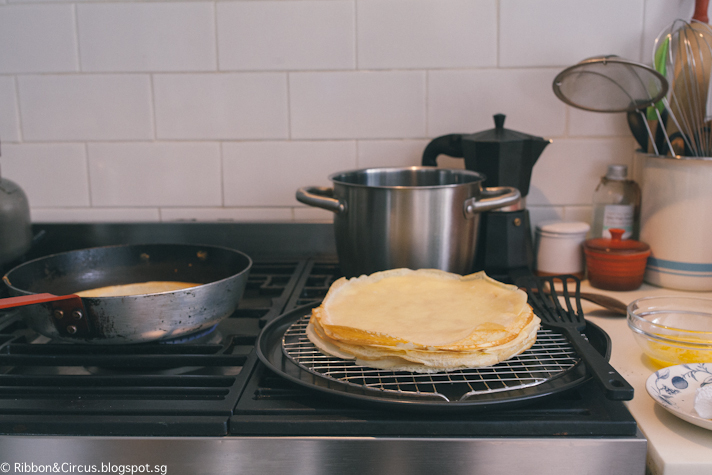 Lay your next crepe on the bench or a plate and spread evenly with one tablespoon of whipped cream. Carefully pick it up and lay it over the crepe in the cake tin, cream side down. 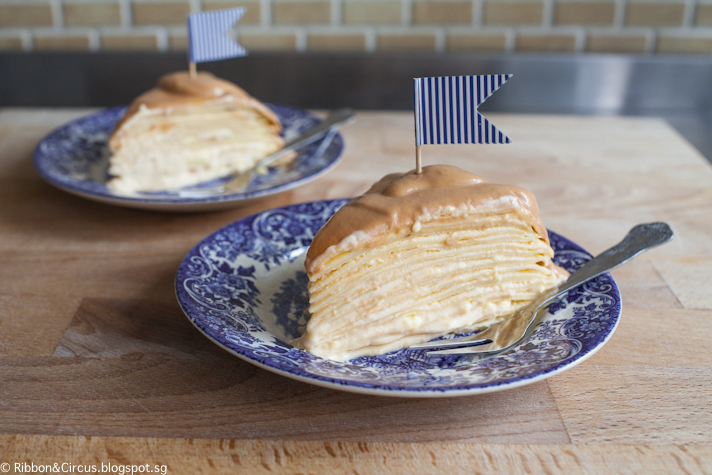 Continue with pastry cream and whipped cream until the final crepe has been added. Or until around 13 layers high.